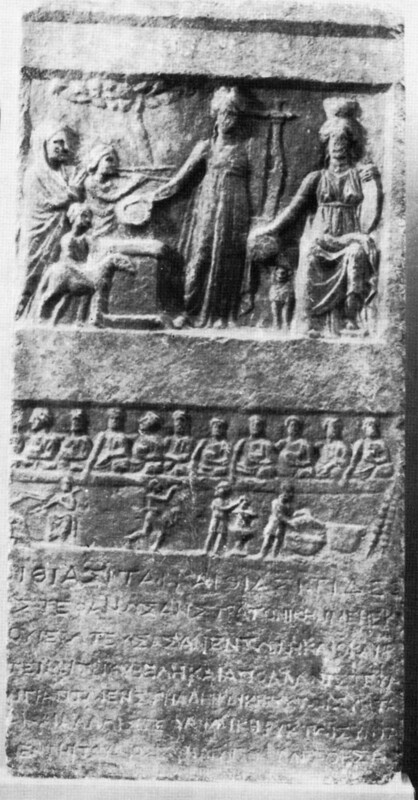 Slab with a relief divided into three panels and an inscription beneath (83 x 39 cm). Found at Triglia. 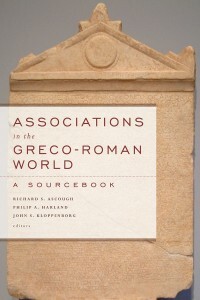 Now in the National Museum at Athens (inventory 1485). The upper panel depicts a sacrifice in honor of Cybele (seated on a throne) and Apollo. The priestess Stratonike approaches the altar with upraised hands in adoration and is accompanied by a girl playing a double flute and a boy bringing forward the sheep. The middle panel depicts the association eating and drinking. The lower panel depicts musicians and a dancer. See images below. 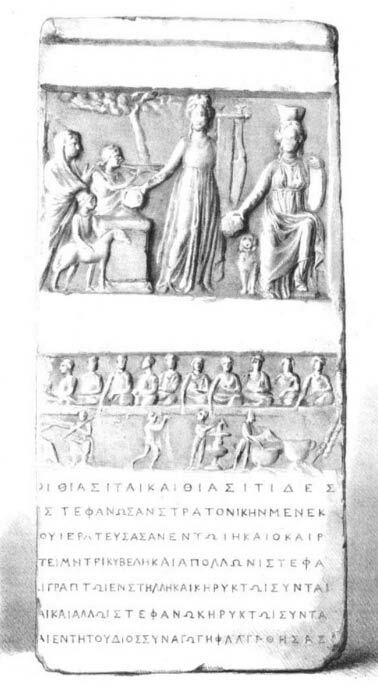 The male (thiasitai) and female (thiasitides) members of the society crowned Stratonike daughter of Menekrates, who was priestess of Mother Cybele and Apollo in the 178th year, with a crown with a band engraved on a plaque that was announced and another crown with a band that was announced in the synagogue (synagogē) of Zeus, since she acted in a benevolent manner. οἱ θιασῖται καὶ θιασίτιδες | [ἐ]στεφάνωσαν Στρατονίκην Μενεκρ[ά]|[τ]ου ἱερωτεύσασαν ἐν τῶι ηʹ καὶ οʹ καὶ ρʹ | [ἔ]τει Μητρὶ Κυβέλῃ καὶ Ἀπόλλωνι στεφά||[ν]ωι γραπτῶι ἐν στήλλῃ καὶ κηρυκτῶι σὺν ται[νί]|αι καὶ ἄλλωι στεφάνῳ κηρυκτῶι σὺν τα[ινί]|αι ἐν τῆι τοῦ Διὸς συναγωγῇ φιλαγαθήσασ[αν]. © 1987 Thomas Corsten. Reproduced with permission. IApamBith 35: Sketch by Alexander Christian L. Conze, Reise auf der Insel Lesbos (Hannover: Carl Rümpler, 1865), plate 19.